Double Sinks in the Master Bath – Must We Have Them? Really? Part I | Just Me With . . . I loved that HIMYM. Barney’s so funny. We were five sharing one bathroom and one sink and managed just fine. In our new place the landlord remodeled the kids’ bathroom and put a double sink in there. Brilliant. I’ll be single with my one sink. I know, right? That’s a classic episode. The sharing gets old, but it’s definitely do-able. It’s fine. People are always amazed, but . . . whatever. We just make announcements — “I’m about to take a shower, does anybody need to get in there first?” Yes, double sinks in the hall bath would be great (I’ve never had that either, though). And me, too, single with one sink. I’m cool with that. 6 people in 1 bathroom! I hated when it was 4 of us and 1 bathroom. I never understood how Barney could sleep with just 1 pillow. I need 2. It can get old, definitely, but we’re managing with the one bathroom. When I was growing up we were five with one bathroom, so I guess I had practice. I only use one pillow, but I could never manage with only half the bed covered. Brrrr. My husband and I used to have a home in which there were two sinks in the master bath. Although we used our separate sinks, it was just because they were there to use. It was rare for us to be in the bathroom at the same time so the second sink was redundant as far as I was concerned. I’m somewhat of a neat freak so my sink was alway clean. My husband is a naturally born slob (however, a very loving one) so his sink looked atrocious before he’d leave for work. (So you know, I am a housewife. With disability, jobs are scarce.) I would clean his sink every day as soon as he would pull out of the driveway. Now we just have one sink in the main bathroom where our toiletries are. Actually the cleaning is easier. We do have a bath and a half in this house. I do like this feature tremendously. There are times when both of us need the privacy at the same time and this takes care of that. Thank you. Yes, it seems if there are two sinks they will be used, but not at the same time and in any event they’ll have to be cleaned. And now you only have one sink to clean in the master. It is nice to have two baths in a house. Thanks so much for commenting, and by the way, you don’t have to explain why you’re home. Thank you! When I was married we had one and a half baths. There was another full bath that needed to be renovated and we’d considered adding a master bath down the road, but . . . plans changed. It was great having that half bath. For guests it’s great because they don’t have to go upstairs and see all your stuff, but even just for family — let’s face it sometimes people have to go at the same time. So, yeah, it’s a little tough with one bath for six people, but it is what it is. Well, there are a lot of kids like The Brady Bunch but only one boy. Loved this post, especially about having multiple sinks in the children’s bathrooms – what a great idea! We currently have 2.5 baths in our house, but since we have three teenage girls getting ready for school at the same time in the morning, they spread out to use all the bathrooms, including my husband and my supposedly “private” one (with its one sink). When the girls were little one bathroom was fine for all of us, but it’s been a blessing having more than one now that they’re older. I don’t have to clean the bathrooms either these days – one of the girls does that chore to pay her monthly cellphone add-ons (she does a terrific job, BTW). Thank you! My sister had a 2.5 bath house when her kids were still at home and she always said that the girls and the boy were constantly in her “master” bath. So, yeah, people use the baths as needed regardless as to what they are designated for. I’ve heard of people to get down to serious business in the guest half bath because it’s removed from everybody else and no one needs to get in there to shower, etc. they they can “read a magazine” uninterrupted. Right now I’m dealing with five teens, four of them girls. It is a challenge. Luckily the girls are not very high maintenance right now and they can get ready rather quickly. I’m pushing the natural look, by necessity — hahahaha! Actually what I do is make sure there are plenty of mirrors around the house. That seems to help. I have to agree. I’m not sure I ever understood the point of his-and-her sinks. Personally, I don’t want my man flossing while I’m cleaning out my ears. Or any other number of things I do in my own morning/nightly “standing in front of the mirror” rituals. And yes, I imagine that following a break-up that extra sink would just mock the owner and serve as a constant reminder of their now-single status. NO THANK YOU. Also, HIIIIII! I’ve missed you 🙂 Great to be back here today! Hope all is well in your neck of the woods. Hello! Thanks for stopping by. All of fine here, give or take. Watched some HGTV over the weekend, couples complaining about getting toothpaste in their hair in the morning because they share a sink. Sounds like poor planning or lack of communication to me. My house? — Six people, one bathroom. No toothpaste in anybody’s hair. Just sayin’ . . . I am single and have a bathroom with two sinks. I like this for three reasons: 1) when one sink gets backed up and I can’t afford a plumber, I can use the other one, 2) no matter how dirty sink one is, i can look over to sink two and it’s clean, 3) it’s an old condo that has something trendy in it that I didn’t pay to have remodeled. If I had a partner, I would still want two sinks even though I doubt we would ever use them at the same time. I refuse to clean up after a man – so his sink would be his responsibility. Ha! Well that sounds like the best reason so far in favor of having two sinks “I refuse to clean up after a man”! Love it. Thanks for reading/commenting. I just discovered your blog and I love it. Ditto on the his and her sinks, never did see the need. I thought I was a weirdo! So nice to see someone express my feelings exactly! Thank you. As I said in the post, I’ve never had the his/her sinks, but if I was designing I’d use that money elsewhere. Two sinks take away counter and storage space. You’re not a weirdo, or maybe we both are! haha! While growing up we had 4 to our single bathroom; in my long marriage my husband and I shared a single master bedroom sink and our children were 2 to a sink in their bathrooms; now, as a widow I have 2 master bathroom sinks and three additional bathrooms (all with single sinks). I survived and flourished over the years even though “sink deprived”. Enough for shallow/stilted/vanity re: requiring two sinks. Personally being currently single (widowed), I don’t like houses with too much emphasis on his & hers sinks/closets etc. When I was married, we started with one sink, and then upgraded to a master bath with 2 sinks, and at that point kinda separated our toiletries. Honestly, I also like that in our current home, the “master” bathroom is not inside the master bedroom. He gets up and leaves my space. It was frustrating at our former home to have him get up and go in there and make a bunch of noise and then come back through the space where I was trying to sleep, while tromping around like a herd of elephants. I like that once he leaves, he’s out and doesn’t wake me up again. And we share the one sink in there just fine. You make a good point. I’ve never had a master bath (and don’t currently have a husband) but when I had a husband and a bath down the hall, he could get up and go in there and not bother me. Thanks for the comment. I have similar thoughts when watching HGTV, though I have a large house and separate Master sinks. When I think of my grandparents’ snug and lovely home where so many childhood moments were spent, it’s interesting to watch young couples House Hunt, turning up their noses at lack of granite countertops or en-suite master bath. Funny how expectations have grown. Just found your blog today. I agree with so much of what you said regarding bathrooms on HGTV. I get so disgusted with the divas portrayed on House Hunter shows. They expect better things in their first home than their parents have after 30+ years of home ownership. I wonder how many of them lost their house during the meltdown. It seems they are buying the house more as a way to impress their friends rather than as a home to live in. My gosh their friends would totally drop them if they didn’t have granite counters and stainless appliances. These people would die if they had to experience a little hardship. Yes, they make a lot of comments about “friends and [visiting] family” and they say they simply cannot live in a kitchen where everything works but is dated. Real friends and loving family will enjoy your company and don’t require granite and stainless steel. It scares me that they are raising expectations of new home owners. They’re raising expectations for home sellers, too. These days some realtors expect you to invest 5-figure sums into updating everything before you put the house on the market. Yes, and the problem with that is that it is natural for most people to personalize the space anyway. My house would be unsellable to any of the HGTV homebuyers even thought I’ve put money, blood, sweat, and tears into it first to make it habitable, then to make it nice. Sigh. I have a new house. 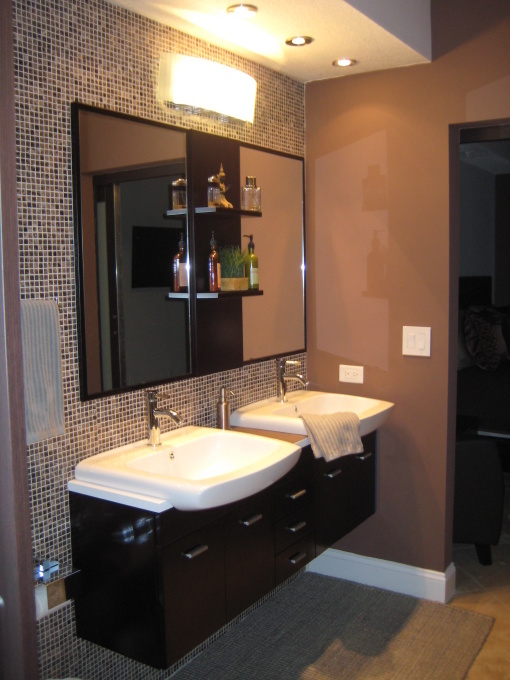 To make the master bath with double sinks costs $1500, to make it with a tub and shower, it costs $4,000 extra. We went with single sinks in the bathrooms. If I do want a bigger counter, I will just buy a nice cabinet and single sinks with a lot more counter for the bathrooms. I so agree! Our second sink just held crap. So when we built, we only put in one. My kids ARE the ones who need a second sink! I’m thrilled to even have a master bath that I don’t have to share with my three teens (although they use it pretty regularly because it’s so nice and clean compared to theirs…) and their numerous friends who sleep over. I don’t understand double sinks and am happy to mostly take turns with my husband. No problem there! Love your blog- just discovered it. I’m a fan! I found you through some article (on Yahoo! maybe?) and completely agree with you. My husband and I are first time homeowners. Our kitchen is dated, we only have one bathroom (no double sinks), and the home needed a ton of repair. Now that we’ve put so much work into our house, we’re never leaving. Double sinks be damned. And when we sell, I figure SOMEONE will want a charming house just like we did. People can live with much less than the shows tell people they can. If the appliances, water, heat, etc. are in working order, than the house can be lived in. The changes people may want and eventually get can be great and exciting, but the house isn’t “uninhabitable” without granite counter tops. I’ve done a lot of home repairs. I strongly suggest that people live in a space for a while, maybe a year, before doing anything major. You’ve got to see how you live in the space in order to prioritize the repairs/designs. And, if you live in a four season climate, you should live through the seasons so you really know how the house feels in different rooms at different times of the year. I plan to move in a few years. I’m hoping someone will appreciate my historic home with walls. I’m so afraid that with the HGTV propaganda, they won’t. I know that if they wanted to take down a wall they would have to remove a chimney, probably some asbestos (which is safely encapsulated now but if disturbed would have to be professionally removed), duct work and electrical lines. It’s not always easy to just take out a wall (tell those Love It Or List It people that). HGTV has fooled people into thinking it’s always easy and then they get mad at the contractors when they are told how expensive it will really be. It’s a shame, really. People should never assume that they can take out a wall without getting an opinion from an engineer or contractor. In fact, assume you can’t take out a wall and see if you can live with that. If not, don’t punish the seller for not having a feature that may not be attainable. It would be like low-balling a seller of split level because it’s not a colonial. Apples and oranges. Years ago I rented a house that had a master bath with double sinks. At first I thought it was cool and used both sinks without thinking about it. Until I realized that two sinks meant two sinks to clean! I went to using just one. Then I got a boyfriend who stayed over several nights a week and he used the other sink. So I was back to two sinks to clean! And not once can I recall both of us using a sink at the same time. I would have much rather had the counter space with a stool underneath instead of an extra sink. How many couples really want to be in the bathroom together at the same time anyway? Who wants to be brushing their teeth when their partner is using the toliet? Who wants to be drying their hair, putting on makeup, when their partner is steaming up the bathroom with the shower? How often do you really want someone hanging around chatting with you while you take a long soak in the tub? I think most people want privacy in the bathroom regardless of what they are doing in there. The enormous bathrooms on HGTV seem like wasted space to me. Pretty to look at, but I’m a get in, get ‘er done, get out girl when it comes to bathrooms. They aren’t places I’d want to hang out in no matter how spacious and pretty. Plus, I hate feeling cold when I get out of the shower and the bigger the bathroom the colder it’s going to feel. I would like to see compartmental bathroom designs. Separate water closet, shower/tub area, sink/grooming area. An alternative for those that don’t have the space for his & hers bathrooms. I couldn’t agree more. I like having a master bath to share with my spouse but I would be loath to be in the bathroom when he is in possession. (Has anyone ever heard of…timing?). Those huge bathrooms that are in vogue just seem like more tile work to clean when cleaning is something I already do with great reluctance (just keeping it real.) Maybe I am lucky that my husband and I are both pretty neat when it comes to hygiene and I do thank my lucky stars almost every day that I don’t have to share a bathroom with my teens (whose bathroom often resembles the “before” picture- although there is rarely an “after”). But two sinks, a couch in the bathroom for lounging on (I suppose from the exertions of getting clean)- giving me a break. And don’t get me started on the”open plan” vogue- I would be lost without all our beautiful walls!!!! I envy you. I have to share a bathroom with my teens. Ugh. I’d like to have a master bath one day, and if I ever have another husband I think that like you, I’d be loath to be in the bathroom when he is in possession. The huge bathrooms do seem like waste of space. I saw one show where they installed a coffee maker — in the bathroom. I thought that was a wee bit excessive. To me, one of the best features of a bathroom is — privacy. Whether it is for the basic functions or for relaxing in a bath, it’s a space where one shouldn’t have to worry about a roommate—or sounds or smells offending (or embarrassing) anyone else. And, it should be easy to clean. I like a nice bathroom. It just doesn’t need to be stadium-like. Privacy is key, and comfort, and warmth. Yes, I completely agree about compartmental bathroom designs. That’s a better use of space and allows people privacy while using the different areas of the bathroom. Probably easier to clean as well. Everyone talks about counter space in the kitchen, but people are talked into sacrificing it in the bathroom for the second sink. I don’t really get it. And, except for when you first buy a house and give the house tour, if you have a master bath no one really sees it. Instead of trying to get the wow factor, people should think of what they want for their own personal use. It’s funny in those big showy bathrooms on the TV shows where people say, “We could have a party in here.” Huh. Yeah, I don’t want to party in your bathroom. When we’re both getting ready at the same time, I enjoy having two sinks in our master bath. There are many non-gross activities that can be done at the same time: washing faces, brushing teeth, applying makeup while he shaves, etc. We don’t tend to do the gross stuff in front of each other. On the other hand, during the week we rarely get ready at the same time, so one sink would be fine for us. But I don’t feel like having two sinks is wasted space as we have a rather long vanity. If it held only one sink, I might be too tempted to leave more clutter on it. I would never choose double sinks with no counter space. Makes no sense. Thanks for you comment. I agree that if there is ample counter space or vanity space available whether or not there is a second sink isn’t really an issue. I find the design choices odd where there are two sinks but no where for the stuff. Often those two sinks are pretty, though. Anyway, I’m sharing with my kids so I have master bath envy, regardless. Even when I was single, I enjoyed having two sinks in the bathroom. I could have hand washables soaking in one sink and use the other for grooming purposes. It doesn’t take long to wash an extra sink, so my husband and I appreciate the two sinks in our master bath now. To each his own…just a personal preference. Great post and discussion! Thank you! As I said, I’ve never had the two sinks even when I was married. I hadn’t thought of using the other sink for hand washables. 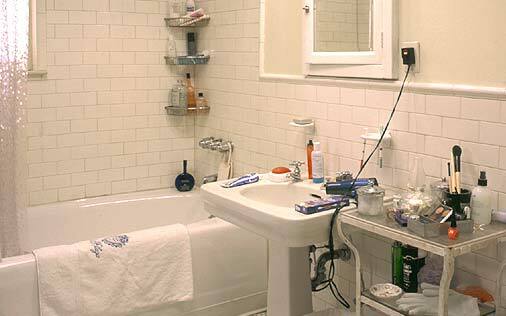 Depending on the availability or proximity of a laundry room or laundry sink it could be very convenient to do that stuff in the master and still have a sink always ready for grooming. If both sinks are being used for whatever purpose, they are a nice perk. I just wish the marketing of homes (HGTV) didn’t suggest that everyone just has to have certain amenities. Like you said, it’s all about perssonal preference. One man/woman’s problem is another man/woman’s perk. Thanks again for visiting and commenting. Amen! My master bath is quite small but has two sinks. This means there is no counter space and so it always looks cluttered. Getting ready in the morning is a real pain. It drives me crazy! I recently went to an open house in a high end neighborhood in my city (1920’s bungalow reno). The master had only one sink. It was perfectly staged and with all the other great features and high end finishes, no one was complaining. I think they did a great job of demonstrating that with the well-thought out storage and other improved functionality, the lack of 2nd sink is a non-issue. It can definitely be a non-issue, even in a high end home. Having storage and counter space is the key. Unfortunately, the TV shows would probably feature a couple who takes one look at the bathroom and says automatically, “There’s no second sink. I really want a second sink.” That’s what gets to me. Home buyers should think of how they do what they do and whether the space would support that, like — “Okay, I could put my flat iron here and the lighting is good for make-up but where would I keep my blow dryer” . . . etc. Functionality. In an effort to make baths modern it seems that contractors/designers add the second sink without also thinking about the extra storage/counter space needed in modern times. In the olden days people didn’t do hair and makeup in the bathroom. Combs, brushes and mirrors were kept in the bedroom (and hair wasn’t washed as often, and there were no blow dryers or flat irons), and people had vanities in the bedroom or in dressing rooms in larger homes. Men could get shaved at the barber shop or shave themselves anywhere there was a mirror and a bowl of water. I think back then people were less willing to spend time in the room where the toilet was. It was different. Under those conditions one wouldn’t need as much storage or counter space actually in the bathroom. In modern times, whether or not there’s a second sink, people need space to dry and style hair and space for the appliances needed to do that. If women stand in the bathroom to apply makeup rather than sit at a vanity in the bedroom, then there needs to be counter space on which to place the make-up. And if you like to hang out in the bathroom and like it decorated and inviting, there there has to be a place to put flowers, candles, etc. So yeah, it all needs to be staged for functionality — in the modern times. Yes! When you think about what people think they need a large bathroom for now, much of it does not include toileting or washing. Much of the non-water-based grooming can be done elsewhere. That’s how we deal with only having one bathroom. No one emerges from the bathroom ready for the runway. We emerge from the bathroom clean (or relieved) and get ready for the world in our rooms. I still blow dry and flat iron my girls’ hair, but I don’t do it in the bathroom. Yeah, the more people who share a bathroom, the better understood the principal of “get in, and get out.” There is no point in getting accustomed to a lot of primping in there, because inevitably someone is going to chase you out because they have to “go”. Despite the fact I’ve had many bathrooms to myself (or shared with just one person) I still don’t like spending any more time than I have to in one. Old habits? P.S. I love your blog. I think I’ve read all your posts now. Please keep writing! I’m watching House Hunters right now as I write this and it is a young newlywed couple living with her parents. They want dual sinks, a 5 piece master bath, a large master bedroom and the girl absolutely needs a special room in which to do her digital scrapbooking! Excuse me…..who really needs an extra room for scrapbooking? And how much time do you really spend in the bedroom? Do a lot of people sit in the bathroom The people on this show are absolutely nuts, and so unrealistic in their expectations that I can hardly stand it. I am just cruel enough to hope they lose the house to foreclosure just so they get a dose of reality. Forgive me. Hahaha! A room for digital scrapbooking? That really struck me as funny. If it’s digital don’t you just need a freaking laptop — and a lap? As for bedrooms, it would be nice to have a relaxing place to rest. Just enough room so that you can put your things away and set the mood. But some of these rooms are big enough to host a party in. And the bathroom thing — if you like a nice long bath, that’s cool, but again how much space is needed for that? A bathroom should be easy to use and easy to keep clean. I’m not gonna lie, I wish my bathroom was bigger. The rub is very close to the toilet and I don’t don’t have a separate shower and no storage. But, it works. HGTV does feature families who seem to be living beyond their means or beyond anyone’s reality. There’s very little concept of starter home and no real gratefulness for being able to buy something in the first place. I mean when you go from living with your parents to your first home, you should be excited just to have a place of your own! I admit, I had to stop watching HGTV totally. It was getting to me too much. And it was making me worry that my little home won’t find a buyer when it’s time because starter home people have been brainwashed to expect a palace! Ugh. We eliminated the 2nd sink in the master bathroom but didn’t have the foresight to have the 2nd sink in the main bathroom. The kids were 4 and just born when we moved in and we didn’t envision teenagers using the bathroom. I always thought a couple should have his and her bathrooms. Me and Mine were good and grown when we met and each owned their own place. He had a bathroom at my house and I had one at his. THAT is the root of harmony. FYI there is at least one house for sale in metro Atlanta with his and hers bathes on the MBR. I have double sinks in my bathroom. I was married when the house was first built, but now it’s just me. Occasionally my girls will use it, but I feel like it’s just wasted space. I am absolutely frustrated about absolute black granite counter tops in high-use areas. 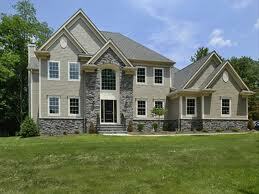 I recently purchased an existing home that has beautiful granite countertops throughout – except the master bathroom. Every time I wash my hands or brush my teeth I must (underline must) get out Windex and wipe down he surface because every imaginable speck and water drop makes the surface appear grossly neglected. Thank you for the article, whimseygal, I cannot use the information for my master bath counter top, but I can for my bar sink!!! Great article. 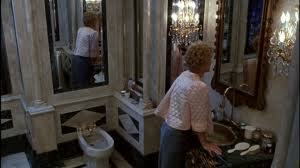 My wife, who is Chinese, says double sinks are bad Fung shui. It encourages separation between the couple. Conversely, one sink imposes cooperation and unity. I don’t know about all of that, but it doesn’t make sense to me why you would burn up all your available counter space with another sink. I’ve got too much crap to put there, and we don’t even have That much crap…. I think double sinks are ridiculous too. Seriously how often do couples actually utilize the sink at the same time? I am not talking about the counter space……..but the actual sink. Very seldom. You nailed it when you said it was about “I have arrived”. It’s about keeping up with the Joneses. If everyone had a blow up elephant in their bathroom and some home redo channel said it was a growing trend people would start turning down homes that didn’t have any. It’s all about vanity (pun intended) regardless of what people claim. They aren’t necessary. But that’s what we see in the “it’s all about me” growing culture. What’s next? His and her washer/dryer sets? His and her fridge? And I bet people would find ways/excuses to justify it. Thank you addressing this irritating ” must have ” (not!) issues. I’ve turned off HGTV after listening to – sorry, usually the woman- lament over 1 sink, too many walls, cholera- carrying wall to wall carpet, light kitchen cupboards, dark kitchen cupboards, etc. Prospective buyers are beginning to complain now about granite countertops, previously the most essential ‘ ingredient ‘ a cook require for creating gourmet meals. Now only white marble or quartz will do!